It’s time for another giveaway! As usual, I’ll put all the entries in a bag, and draw a winner. Last time, “The Kwan” was a winner! 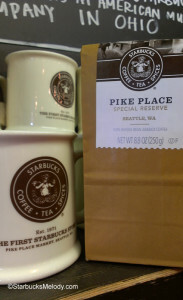 Here’s how you enter to win this bag of Pike Place Special Reserve Starbucks coffee and special made-in-the-USA Pike Place coffee mug: Leave a comment below saying what you love about Starbucks in four words or less. Any comments longer than four words will be deleted. You must have an address within the United States. You must be over age eighteen. You must leave your entry in the comments before October 15, 2013, 5:00 p.m. Pacific Standard Time. Your odds of winning depend on the number of entries (up to 200 entries). If there are more than 200 valid entries, the first 200 are entered in, and none above 200. Only one entry per person, please. Please enter with a valid email address – it will make it much easier for me to reach you, if you enter with a email address that you routinely check. Thanks! As usual, no expletives will be permitted in the comments. Your four words about what you love/like about Starbucks can include the Starbucks family of brands, such as Teavana, Seattle’s Best Coffee, Evolution Fresh, Tazo Tea, and La Boulange. You can write things like, “Pumpkin Spice Latte,” or “Love Tazo Tea,” or whatever you want! I’m looking forward to seeing what you come up with! Both the coffee mug and Pike Place Special Reserve are exclusive to 1912 Pike Place Starbucks! Even if you have had this amazing coffee before, it’s worth it to have it again. I know this coffee has a lot of fans! By the way, if you want to meet the store manager of the 1912 Pike Place Starbucks, read this article! Contest: Starbucks Goodies & Starbucks Roastery Card Loaded with $50. Most Inspiring Job Ever !! !